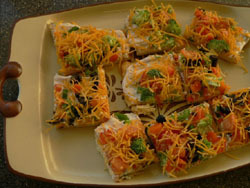 Want to make easy appetizers for your next get together. 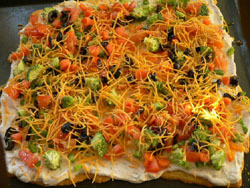 Try cold veggie pizza and tortilla pinwheels. Both are great to feed a large group for party appetizers. Pat crescent rolls in a 15x11 pan and bake 10-14 minutes until golden brown. Mix cream cheese, mayonnaise, salt, pepper, dill weed and taco sauce. Spread on crust once it has cooled completely. Top with chopped veggies and cheese. Cover with plastic wrap, chill in refrigerator for an hour, then cut into pieces and serve. Suggestions: If you do not have the crescent rolls on hand but have all the other ingredients, just use crackers or toasts. Works fine for a simple treat for your game night with the family. That way everyone can put their preferred choice of veggie on it, or try getting little ones to eat veggies by making faces out of the veggies.